W. G. Clarke described three pits or hollows beside Peddar's Way on Roudham Heath, not far from the hamlet of Illington. One was known as Thieves' Pit, "so called because it is alleged that when Illington Hall was robbed many years ago, the thieves left their horses, which had their shoes reversed, at this spot". Source: W. G. Clarke: 'In Breckland Wilds' (Robert Scott, 1925), p.124. Against the north side of the 14th century church of Holy Trinity was once a small priory of 'St. Mary, the Holy Trinity, and St. Victor, for the redemption of captives from the Turks'. Established in 1630 by Sir Miles Stapleton, negligible remains exist in the churchyard itself, the conventual buildings forming the nucleus of the nearby Swan Inn at the staggered crossroads. The story goes that when the church altar was taken down for repairs in the 1860s, not only were found 19 skeletons piled beneath it, but also the entrance to a tunnel that supposedly linked the priory with the Manor House ½ a mile away. Unfortunately this passage, never explored, was sealed up again. Source: Ernest R. Suffling: 'History & Legends of the Broad District' (Jarrolds, 1891), p.39-40. Just over the churchyard wall, again on the north side, is a deep and wide depression, now grassed, overgrown, and part of someone's garden. This is the site of a former gravel pit, which was once allegedly haunted by the apparition of a "tall pale lady." Source: Ernest R. Suffling: 'History & Legends of the Broad District' (Jarrolds, 1891), p.125. 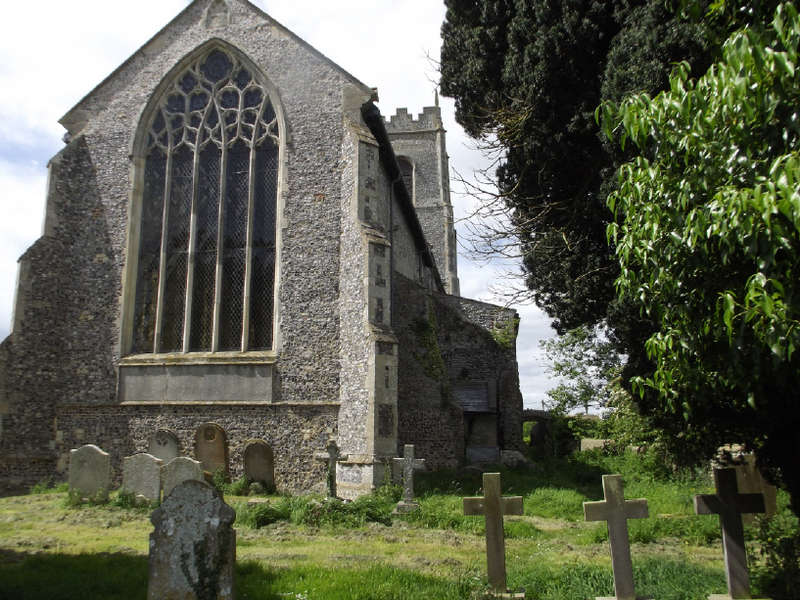 The 'Sanctuary' was a name once given to a wooded area complete with deep depressions or hollows in the ground, next to the ruins of St. Mary's church or chapel at Mannington, which is now part of the parish of Itteringham. Although on the other side of the road to Mannington Hall, it was still within the Hall's grounds. In 1901 R. J. W. Purdy described some boulders close to the entrance of the Sanctuary as "so-called Druid's stones", with "polished surface and glaciated scratchings", and imagined them to be "reeking with the blood of victims offered as human sacrifices". For years I had mistakenly believed the Sanctuary to be at the Hall itself - until I visited the old church in the summer of 2018, then re-read the original source material. Although only one now remains, there at the edge of a deep hollow just as you enter the environs of the churchyard is indeed a large, greyish-green, sandstone boulder (at TG14213188), measuring 105cm x 58cm x 51cm high. Source: R. J. W. Purdy: 'Mannington Hall' in 'Norfolk Archaeology', Vol.14 (1901), p.327. A large drain is almost certainly responsible for the legend of a tunnel from the moat around 15th century Mannington Hall (TG145322) to the 700 year old remains of the church, just across the road. Source: 'Norfolk Archaeology', Vol.16 (1904-5), p.94.